Livestock water is a crucial component of beef cattle production. While water is obviously essential for survival and cattle health, what is less well know is how important water is to cattle weight gains. Even if sufficient cattle water is available for survival, cattle will limit their forage consumption if water is perceived to be a limited resource in their grazing environment. Perceptions matter to cow psychology. How you construct your livestock water trough, the design of your water corral, and the type of access that your cattle have to their water source will all directly affect the grazing behaviour and weight gains of your beef cattle herd. Any flaw in the design of your water system will cause stress to your cattle herd. Competition for water access causes cattle to limit their grazing time and spend excessive time lounging around the water trough instead, which in turn will reduce cattle weight gains, increases disease pressure as manure builds up around the livestock waterer, and will reduce the flavor and tenderness of your beef product. 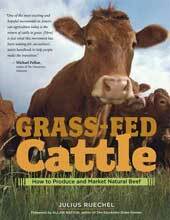 You want your cattle to compete for grass, not water. The design of your water corral is therefore one of the most important components of your rotational grazing program and of your beef production strategy. In this article I will explain how to design your livestock water corral so you can maximize grazing time and minimize time spent around the livestock waterer. This article assumes that your water source will be a permanent water site, which your cattle reach by traveling from their pasture rotation to the water trough. If, instead, you use a mobile water tub that is filled via a quick-connect hose that attaches to a network of pipes within your pasture rotation, then I recommend reading the article about how to design your mobile cattle water system from the article list in the Livestock Water section of this website. The first step in designing your cattle water site is to figure out your cattle's daily water requirements and the peak demand flow rates required at the trough to ensure that your cattle do not need to spend all day waiting around at the trough to get their fill of water. Calculating your water supply to meet the daily water requirements of your cattle herd is not enough. Your water sites must also be able to provide a very large peak flow rates so that all the cattle can drink their fill within a very short time period without getting the sense that water is a limited resource. It comes down to simple cow psychology - any resource that is perceived to be limited will be dominated by a few dominant cattle as a means of protecting their own access to this resource. The entire herd will begin hanging out at the livestock waterer all day long instead of grazing as cattle become worried that there may not be enough water to go around. Individual herd members will even try to block other cattle from accessing the water trough in an attempt to hog the slowly-filling trough for themselves. This creates stress and limits grazing time, which will reduce cattle weight gains and affect meat quality. Providing a flow rate sufficient to meet peak water demand is essential to maximize grazing time and limiting time spent in the water corral. Limiting time in the water corral is also important to prevent mud and manure buildup in the corral. Reducing manure buildup around the water site reduces disease pressure and prevents valuable fertilizer nutrients from being transported out of the pasture. Ironically, if the peak flow of the trough is addequate to supply the whole herd at once, if the trough is large enough to minimize waiting times, and if the alleys and corrals are big enough to handle the whole herd travelling to water at once, the cattle will learn that there is no reason to worry about whether there is enough water for everyone. Their behaviour will change so cattle may begin trickling in to water individually throughout the day instead of going to water as a single mob. But create a bottleneck anywhere in this system and the whole herd will drink as a mob, where the first movement by a single individual in the direction of water will cause the entire herd to abandon grazing as they each rush to water to secure their fill. Follow the article link to see tables for calculating your daily cattle water requirements and peak flow rates. Cattle watering behaviour also changes dramatically depending on how far your cattle must travel to reach water. When the livestock water site is located in sight of the pasture, cattle are likely to travel to water individually, as needed, trickling in to the water corral throughout the day (as long as the trough is capable of meeting peak demand flow rates). But if they need to travel further away from the pasture and the security of the herd to reach water, they will begin going to water as a group to maintain their sense of security. If the livestock water site either far away or completely out of sight of the pasture rotation, then your cattle will likely time their drinking so that the entire herd travels to water as a single group. That means building alleys wide enough to accommodate this kind of traffic flow and using large trough sizes to minimize waiting time around the water site. Trough size matters because it affects how long cattle need to wait around to get their fill. Larger trough sizes can also partially compensate for cattle water systems that are struggling to meet peak demand flow rates. Increasing flow rates at the trough to meet peak demand is not always easy. It is often too expensive or impractical to dig up long water lines. Or perhaps the well supplying the trough only has a low flow rate, which is capable of meeting daily cattle water requirements but not peak demand flow rates. Often the easiest and most cost-effective solution to solve a slow trough refill-rate that is to create water storage on-site at the water trough. One option is to store additional water in a storage tank beside the water trough, as shown in the image below. Gravity-feed water from the tank to the trough at high flow rates using a large-diameter pipe and float valve in the trough so that short-term flow rates at the livestock waterer are capable of meeting peak demand. Plumb the water supply line (from the well, pump, or other water source) into the tank with a ball-float to shut off the water when the tank is full. This combination gives the tank all day to refill slowly while still being able to supply high flow rates to meet peak demand. The alternate solution is to increase the trough size so that the trough has all day long to fill. A large trough size can compensate for a slow refill rate so that peak demand is met by the large storage capacity of the trough. However, with large herd sizes the best solution is often to use a combination of a large trough and on-site storage, as shown in the image below. This combination keeps peak flow rates reasonable and ensures that the trough size does not become excessively large and difficult to clean. Prior to adding the water storage tank to this water site, the well and underground supply line was only barely able meet the daily water requirements of 400 cow/calf pairs during their summer pasture rotation. Because flow rates were so low, the cattle had to wait around all day in the water corral just to get their fill. By adding an on-site 10,000 gallon water tank, peak demand is now being met because the trough is supplied by the tank (gravity-fed) at high flow rates. After the water tank was added, cattle weight gains increased, cattle health improved, and the corral dried up because the cattle no longer spent all day hanging out in the water corral. Even if peak demand flow rates are met and if the cattle water corral is within site of the pasture rotation, there will still be times when the entire herd will go into the corral at once. Your livestock water corral should therefore be large enough to comfortably contain your entire cattle herd so that calves are not crushed or trampled and so your entire herd can fit inside without busting through fences. Since your cattle will go to water every single day, the water corral is also an ideal place to put a small sort pen and head catch to capture and treat animals that require veterinary attention. Unless this is also your primary cattle handling facility, it does not need to be fancy, but the option to catch and treat animals in the corral is worthwhile incorporating into your cattle corral designs. Your livestock water corral should always be built on well-drained soils and on a topographic high point to allow for easy moisture drainage. If necessary, build up a gravel mound under and around your livestock waterer to ensure good drainage around your water trough. You may even want to stabilize soft soils underneath the gravel using a geogrid, which are commercially-available woven fabrics commonly used to reinforce retaining walls and for road construction across soft ground. The concrete pad around the trough should be large enough for the cattle to comfortably stand on with all four feet while drinking, but short enough so that manure and urine can drain away from the trough. Over time, the gravel at the edge of the concrete pad will often erode away, especially if the water site has poor drainage and is prone to getting muddy. A large step or a muddy quagmire at the edge of the concrete pad around the trough is one of the most common places where cattle injure their feet as they get on and off the concrete pad to reach water. The high bacteria load in the soil around the water site is then able to invade the cattle's feet and cause infection. A poorly drained and muddy cattle water corral design with a sharp drop off the end of the concrete pad is therefore one of the leading causes of foot rot in cattle herds. 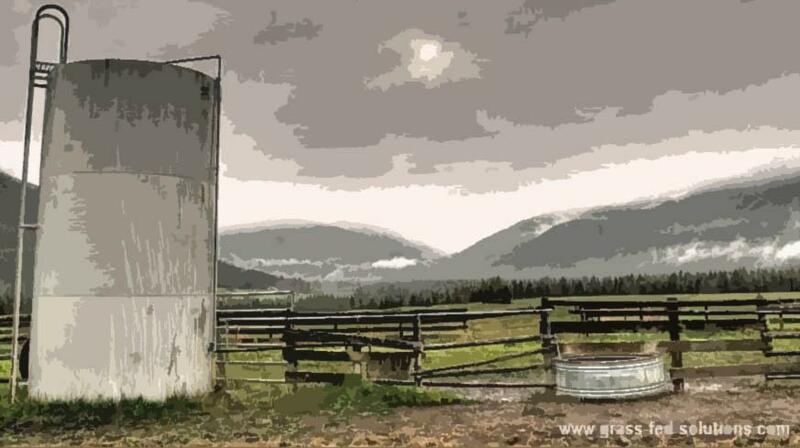 Make sure your cattle corral designs are well drained, sloped away from the water trough, built on firm ground, and that you maintain a firm and level connection between the concrete pad and the gravel slope behind it. A livestock water site should be carefully graded and sloped, be built on firm, well-drained soil, and the concrete pad around the livestock waterer should be large enough so cattle can stand with all four feet on the pad while drinking. Water quality is directly related to cattle weight gains. Contaminated water is obviously a health risk for your cattle herd. But contaminated or dirty water, or water that tastes bad or is full of algae is also less appetizing. 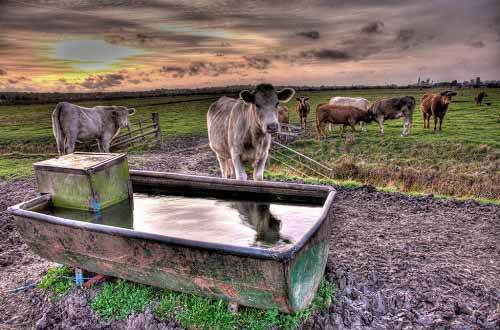 If cattle choose to drink less because the water tastes bad, they will reduce their cattle weight gains. When cattle reduce how much they drink, it forces them to also reduce how much they eat because water is an integral part of digestion. Thus, not only do you need to ensure that the water quality is good to begin with, but you should also make it a habit to regularly clean your water troughs. Install a large drain plug in the side of large tub-style livestock waterers so you can quickly and easily drain and then clean your tubs. This simple task will make a big difference to cattle weight gains because it ensures that your cattle remain eager to consume the maximum amount of water required to maximize grass digestion. Your trough design will depend on whether your livestock water corral will continue serve as a winterized water site in frost-prone regions of the world. Large, open, uninsulated tubs work great when temperatures are above freezing. Ice preventer valves designed to use the latent heat from the water to keep the trough from freezing. How to create a continuous flow trough layout. How to build an energy-free livestock waterer that uses soil temperatures below the frost-penetration zone to warm water in the trough and keep it frost-free. You may also want to read the article about how to train your cattle to eat snow, as this is also a viable alternate winter water solution, as long as your winter grazing management allows your cattle to voluntarily switch to eating snow rather than forcing them. Part III of the Smart Electric Fence Grid - how to integrate cattle water into your electric fencing system. Mobile Cattle Water - how to create a mobile livestock water system for your rotational grazing program. Or, return to the article index on the Livestock Water main page to learn more about how to build and maintain a cattle water system for your pasture rotation.